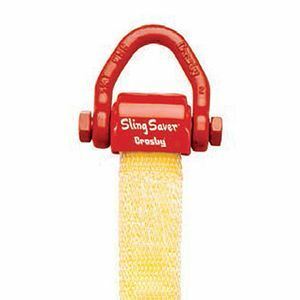 The Crosby S-280 Sling Saver Web Connector is a specialty fitting that works much like a shackle, and is designed specifically for use with with Type III (Eye & Eye), Class 7, 2 Ply flat web slings and round slings. It may work with other similar slings as well, such as flat endless slings and some Type IV tapered eye slings. Easy to install in the field, the S-280 connects synthetic slings to conventional rigging hardware including eye hooks, master links, rings and other shackles. It features all alloy construction and a durable vinyl cover that protects the sling's eye and keeps the sling positioned correctly on the spool. The increased radius of the spool gives a wider sling bearing surface resulting in an increased area for load distribution, which allows 100% of the slings rated Working Load Limit (WLL) to be achieved. Safety factor of 5:1.